March and April have been crazy months for the editors at Apparition Lit. Judging by Twitter chatter, we’re not alone and in good company for the madness that is 2018! While we normally pick a topic for our Monthly recommendations (Flash Fiction, Poetry, etc… ), this month we decided to follow the example of the fluctuating weather of April, and create an Apparition Lit Recommends free-for-all! It’s a pick-a-mix of media/entertainment/creative ventures that our Editors discovered and loved over the past 4 weeks. While we each picked something different to share with you, the one thing we all agree on is that sharing great art, whatever the medium, is vital. Supporting artists, and introducing friends to new and interesting things, helps us all keep growing, learning, and, most importantly, entertained! The last couple of weeks have been extremely stressful for me. Work. School. The usual. Something that brightens my week, no matter how stressed I am, is the podcast Wonderful! on the Maximum Fun podcast network. Every week, Rachel and Griffin McElroy discuss something that’s provided them joy. They also read emails from listeners. The wonderful things they discuss differ wildly from week to week but often include media and food (two things that I personally love). Listening to a couple talk enthusiastically about things gifts even the most difficult of days with a little bit of wonder. That illness everybody had this winter? It tackled me, hard. The damn thing held on for a few months. After a long time of not being able to read or focus, on movies or TV, I finally had a day where my brain yawned and stretched and said “I could eat.” So I fed it! I grabbed for the book sitting on the top of the TBR tower by the bed, which happily turned out to be the 3rd book in the John Dies at the End trilogy: What the Hell Did I Just Read. It’s got monsters and a moral. I was so thrilled to be able to think again, that I consumed the entire thing in one day! So yeah. I recommend it! I spent ages debating what to recommend. I burned through my TBR pile, daydreamed about writing Dread Nation fanfiction, but my continued source of joy over the last few months has been Syfy’s The Magicians. I hated the source book by Lev Grossman with a passion. It was one of those books I threw across the room and loudly denounced to my friends. While I heard that the second and third were much better, I just couldn’t forgive the first. The television show on the other hand, I’ve loved from first sight. This season has been time traveling, dimension swapping, Bowie singing fun. If you love magic, bisexual characters, fun swears, and magical repercussions, this is the show for you!! Oh, you winter that won’t quit, how you bum me the hell out. I’d like to say I handily beat the seasonal blues with vigorous exercise, but I find it’s much easier to slide shamefully into a pit of streaming movie binges and mindless media consumption. Around this time of year, when I start to pull myself out of said pit, the things I watch and the things I read get less mindless and way more worthwhile. 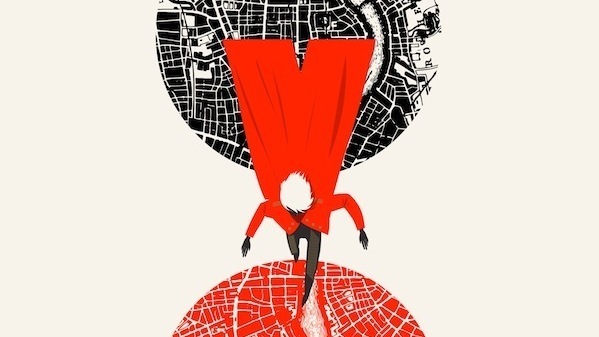 So, allow me to recommend… My current reads: Monstrous by MarcyKate Connolly (I bought it for my 9-year-old son and immediately stole it from him) and A Darker Shade of Magic by V.E. Schwab (I’m probably the last person on the planet to finally read this and, predictably, fall in love with it). And my current watch: Season 2 of A Series of Unfortunate Events (NPH is everything and Carmelita should get her own spinoff).